Tucked away by the Li River in Guilin, China is this creative guesthouse called The Other Place Guilin Litopia that’s a designer’s paradise. 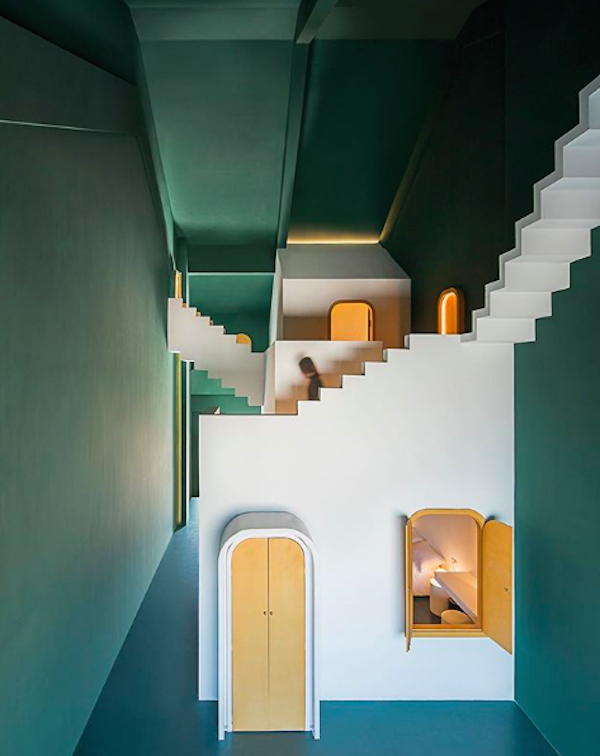 Its guest rooms have been designed after the famous optical illusions or impossible constructions of Dutch graphic artist Maurits Cornelis Escher, also known as M.C. Escher. The ‘Dream & Maze’-themed guest rooms, which were made by design firm Studio 10, feature elements reminiscent of the iconic Penrose stairs that inspired Escher’s 1960 Ascending and Descending lithograph print. The rooms come in minimalistic pale pink-and-white as well as forest green color palettes that give occupants respite from the chaos of urban life. Take a look at the gorgeous interior designs below. Guestroom Maze at Creative Guesthouse The Other Place #litopia - Anti-gravitational stairs lead to golden doors, behind which there could be a trail leading to a secret forest - or some other unexpected findings that surprises you. Photo by Chao Zhang. The Other Place is a creative guesthouse by the Li River in Pingle County, Guilin, China, and Studio 10 has just finished the renovation of its Dream-themed guestrooms. Inspired by the works of M.C. #escher , the architect meant to create a series of mysterious, infinite and impossible spaces with the seamless transformation amongst 2D,3D as well as Optical Illusion elements.Photo by Chao Zhang.